RIVER OF NO RETURN had ingredients for a powerhouse with Robert Mitchum, Marilyn Monroe and the Canadian Rockies but the tame script (Frank Fenton) and blasé direction from Otto Preminger don’t give the stars much chance to flex anything beyond the physical. 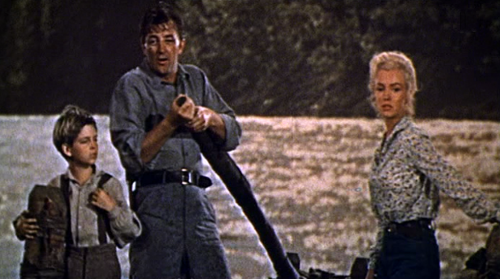 Mitchum gets lines like “He can run, but he can’t hide” and “She’s that kind of woman, son” while helping MM track down her no-good man, essayed by the likable Rory Calhoun. Most of the 94 minutes has the stars (and Tommy Rettig as Bob’s boy) making their peril-clogged way down a river on a raft. Besides the dialogue,they have to contend with a cougar, raging rapids and some particularly clumsy Indians. The scenery, mostly in Banff and Jasper National Park’s, and on Idaho’s Salmon River, is breathtaking, but the process shots of the actors riding the craft are ridiculous—Preminger & team did a lousy job matching things. He also had a tough time with Monroe, since her domineering acting coach, Natasha Lytess, interfered from the get-go, resulting in one of Marilyn’s worst performances. For all of us red-bloods out there, she does manage to get her low-cut blouse torn and sopped a-headin’ downstream, and shows up in some yowza dance-hall duds, so all is not in vain. The funkiest bit is when Bob gets to lasso, with one try, a deer, over the antlers, in the river, as the raft careens by. That could happen, right? With Mervyn Vye, Douglas Spencer, John Doucette and Will Wright; the $2,200,000 movie came in at a healthy #19 of the years hits, soaking up $8,360,000.